RSS Club Sport Coil Overs, are designed for the committed motorsport enthusiast who is willing to relinquish some ride comfort in return for ultimate handling performance. The firmest coil-over in the H&R street line, the RSS is the choice for weekend track and club sport events. Equally at home on street or track, H&R coil-overs provide enhanced performance, improved corner-holding ability and a sleek, aggressive stance-without the bone-jarring ride of some less-advanced suspension systems. 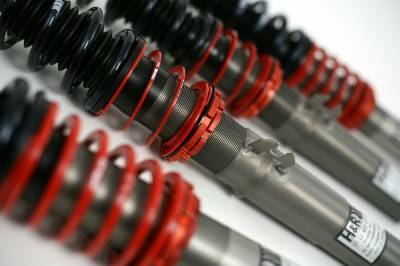 All H&R coil-overs are hand-assembled in Germany to rigid ISO 9001 and German TÜV standards.